It's slightly imperfect, so you get it for an outstanding price! Minor flaws on this spectacular deal may include wrinkled pages, stray marks, missing dust jackets, dented corners or spines, dusty page edges, or minor cracks in CD cases. Charles Colson called it "the best book on Christian leadership I've read." Discover why this timeless classic continues to equip tomorrow's ministers---and challenges today's shepherds---toward greater effectiveness! Revised and updated, Sanders's hard-hitting study explores the essential qualities of a godly leader---and offers sterling examples from Scripture and Christian history. Includes study guide. 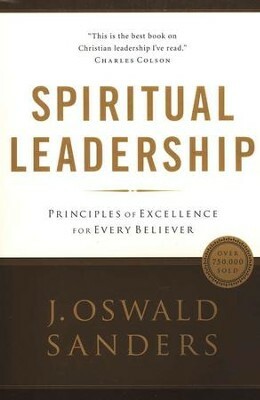 In these pages, J. Oswald Sanders presents the key principles of leadership in both the temporal and spiritual realms, illustrating his points with examples from Scriptures and the biographies of emenent men of God. Slightly Imperfect. I'm the author/artist and I want to review Spiritual Leadership: A Commitment to Excellence for Every Believer - Slightly Imperfect.